Whether you sell pharmaceuticals, or simply have extra supplies around your home you would like to have stored away for a rainy day, knowing how to properly store pharmaceuticals makes all the difference in the world. Many people keep pharmaceuticals in their medicine cabinet, or behind their mirror in the bathroom, and that’s fine for normal household use. If you are planning on storing pharmaceuticals (whether it’s a small amount, or a large one) for a long period of time, below are some pharmaceutical storage tips to keep in mind. When you are storing something that is temperature sensitive, such as pharmaceuticals, it is important that you invest in a storage space that has climate control. Pharmaceuticals should always be protected from extreme heat and cold, and keeping your storage space between 50 and 80 F is the bare minimum you should do to ensure things are being stored safely and correctly. Most self storage facilities have security measures in place (some more robust than others) to ensure that their clients’ goods are always well looked after and protected from thieves. 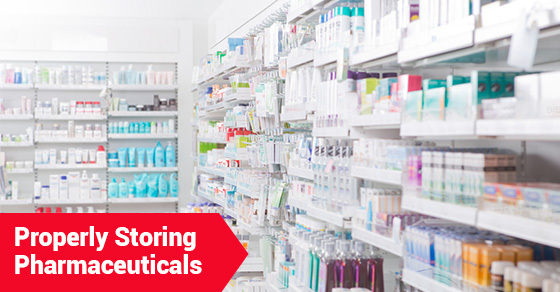 If you are storing a large amount of pharmaceuticals, security should be a top priority. Many types of pharmaceuticals are sought after by thieves for sale on the black market. Try not to advertise the fact that you are storing pharmaceuticals, perhaps by using nondescript boxes, and make sure that you have security measures in place. If you are storing things like pills and medicines that you are eventually going to be using yourself, or giving to your family, you want to be sure that you know what you are taking and giving. This is all the more true if you are buying generic pharmaceuticals online that don’t come with distinctive packaging or labels. In addition to climate controlled storage to make sure your pharmaceuticals are being stored at the proper temperature, you also want to be sure that their integrity or usefulness is not compromised because they are crushed. If you are storing pharmaceuticals in a flimsy box, and you have a bunch of heavy boxes resting on top of it (potentially crushing and damaging them), you might find the chemical compounds have lost some of their efficacy when you go to use a particular pharmaceutical. It is always a good idea to stock up on things like pharmaceuticals and to keep important things on hand just in case of emergency, but delicate chemical compounds have delicate storage needs. Keep the above considerations in mind when storing pharmaceuticals, and make sure you are keeping important medicines and other pharmacological drugs safe and sound.